The Episcopal Church, or the Monastery of Curtea de Arges, was founded by prince Neagoe Basarab between 1514-1517, on the site of a metropolitan church which had been raised in the 14th century and acknowledged by the Archbishopric of Constantinople in 1359.The legend has it that one day, a very wealthy and religious Wallachian prince, the Black Prince, rode with nine masons and their master Manole to find a place and build a church more beautiful than anyone may have seen before. The masons started to work, but whenever they reached to the top, the walls would colapse before they could ever finish it. They decided that the first human being they would lay their eyes upon was to be sacrificed in order to see their work done. And it so happened the Manole 's wife showed up to bring her husband's lunch, so that he had to keep his vow and immure his own wife alive within the church walls. The place of this immolation can still be seen between two walls of the southern front side of the church. This is how the monastery could be finished, and the prince was pleased to find that it was as beautiful as it could be. But the prince would not want Manole to build another church that could match his own. So he ordered the scaffolding removed, which left Manole stranded on the roof. In an attempt to escape, Manole made himself a pair of wings from shingles, but they were of no avail, and he would crash to the ground like Icarus and die. Upon his crash, on that very spot, a spring would gush forth, which is now called Manole's well. Today people would throw coins in its basin, to make their wishes come true. Indeed Neagoe Basarab (1512-1521) would be known in history as the Black Prince, and it is a real fact that the church master builder's name whom he had brought from Nicosia was Manole. Again it is no less true that the prince himself supervised the construction of the monastery all the way, from the beginning to the end. 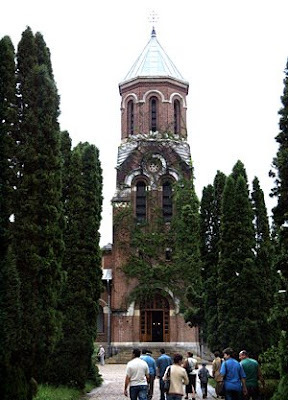 The church one can see today is not Manole's original creation of 1517, but a recreation of 1875-1876 by the Frenchman Lecomte de Nouy, who grafted on all the pseudo-moorish accretions. 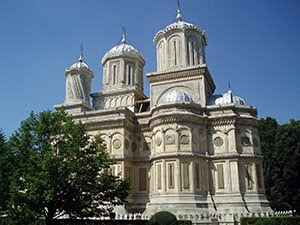 Like with so many other cultural sites of the world, at Curtea de Arges Monastery legend and truth intermingle and form up an inseparable whole, lending a special flavour to the flow of historic facts and figures. The Monastery Curtea de Arges, built in Albesti stone along with marble and mosaic brought from Constantinople by Neagoe Basarab (1512-1521), has the classical harmonious aspect of an Orthodox church: the pronaos (also a necropolis), the nave and the altar have a peculiar architecture and rich ornaments: a boxy structure enlivened by whorls, rosettes and fancy trimmings rise into two octogonal belfries, each having eight narrow windows frames, each festooned with little spheres and the three armed cross of Orthodoxy. The roofs of the four belfries seem to have been made by a goldsmith, whereas the chains which support the crosses seem to be large pieces of jewelry. A belt carved in stone as a rope twisted in four goes all around the church dividing its exterior walls into two sides, namely the lower side, decorated with rectangular tall panels framed in carved stone, with narrow windows, and the upper side, with a range of largely opened arches which encircle the church. The decorations of the disks which link the arches have Arabian, Persian and Georgian motifs, in green, in blue and golden colours. Prince Neagoe Basarab died before he saw his "temple" finished. His son-in-law Radu from Afumati (1522-1529) took over and brought Dobromir of Targoviste to paint the interior walls (1526). Unfortunately, the paintings restored in 1875 by Emile Lecomte de Nouy's brother are inferior to the original ones. Fragments of the genuine frescoes made by Dobromir can still be seen at the Art Museum and at the National Museum of History in Bucharest. 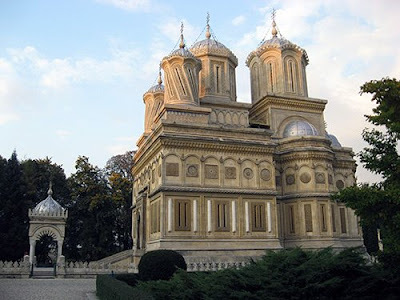 Along time, the church was successively damaged by wars, plundering, earthquakes, fires and was restored during the rules of Princes Matei Basarab (1632-1654), Serban Cantacuzino (1678-1688) and Bishop Iosif Sevastis at the end of the 18th century. Whatever the patrons and artists who designed this church, it remains impressive by its votive paintings, by its marble gilted bronze, by its onyx iconostasis, by its twelve columns with floral ornaments representing the twelve apostles. 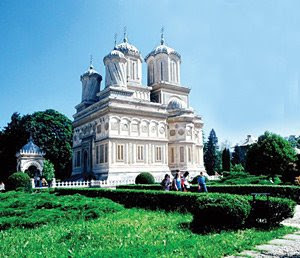 In the pronaos there are the tombs of its founders, Neagoe Basarab and Radu from Afumati, as well as of the first couples of Romanian kings and queens (Carol I and Elisabeta, Ferdinand and Maria) which render this church not only a princely, but also a royal necropolis, alongside a splendid monument of Romanian art and history. The white marble tombstones of Carol 1 (1839-1914) and his poet wife Elizabeth 1853-1916) lie on the right in the monastery`s pronaos (entrance hall). On the left of the entrance are the tombstones of King Ferdinand 1(1856-1927) and the British-born Queen Marie (1875-1938) whose heart, upon her request, was put in a gold casket and buried in her favourite palace in Balcic in southern Dobrogea. Folowing the ceding of southern Dobrogea to Bulgaria in 1940, however, her heart was moved to a marble tomb in Bran. Neagoe Basarab and his wife Stina are also buried in the pronaos. In the park opposite lies the legendary Manole`s Well (Fintina lui Manole). Legend has it that Manole tried - and failed - to fly from the monastery roof when his master Neagoe, removed the scaffolding to prevent him building a more beautiful structure for anyone else. The natural spring marks his supossed landing pad. The Old Princely ChurchThe saint patron of the chapel is "The Saint & Martyr Filofteia" who has been protecting the monastery for 8 centuries and whose relics are inside the Episcopal Cathedral. In 1517, the canonization of Saint & Hierarch Nifon, The Patriarch of Constantinopole, the Metropolitan of Wallahia took place here. This is also the place where the relics of the Saint Nifon are preserved in a coffin made of silver and plated with gold. The Saint’s head and hands represent a present got by Neagoe Basarab from the monks who live in The Athos Mountains. There is also a coffin with the relics of the Saint Serghie, Vach and Saint Martyr Tatiana.